Background: Prostatomegaly is common in men past fifth decade of life and has been the most common cause of symptoms associated with lower urinary tract obstruction. The emergence of prostate-specific antigen (PSA) has come to rescue of clinicians at screening the prostate cancer by its raised value in serum. The further research over the PSA brought out few new indices which are sensitive in screening and suggesting prostate cancer such as the ratio between free and bound PSA, PSA density (PSAD), and PSA velocity. Objectives: The objective of this study is (1) to study serum PSA level and PSAD at the differentiation of benign prostatic hyperplasia (BPH), prostatic intraepithelial neoplasia, and prostatic carcinoma (PCa) established at prostatic tissue diagnoses, (2) evaluation of the significance of total prostate-specific antigen (TPSA) level in the intermediate range of 4–10 ng/ml at assessment of benign versus malignant prostatomegaly at tissue diagnoses, and (3) to draw cutoff values of PSAD (0.15 vs. 0.18 ng/ml/cc) in suggesting benign versus malignant prostatomegaly at tissue diagnoses. Materials and Methods: Digital rectal examination was carried out in suspected clinical cases of prostatomegaly. One hundred and eight cases of prostatomegaly have undergone TPSA estimation prospectively by Vidas TPSA kit. PSAD was calculated as the ratio between TPSA and the volume of the prostate. 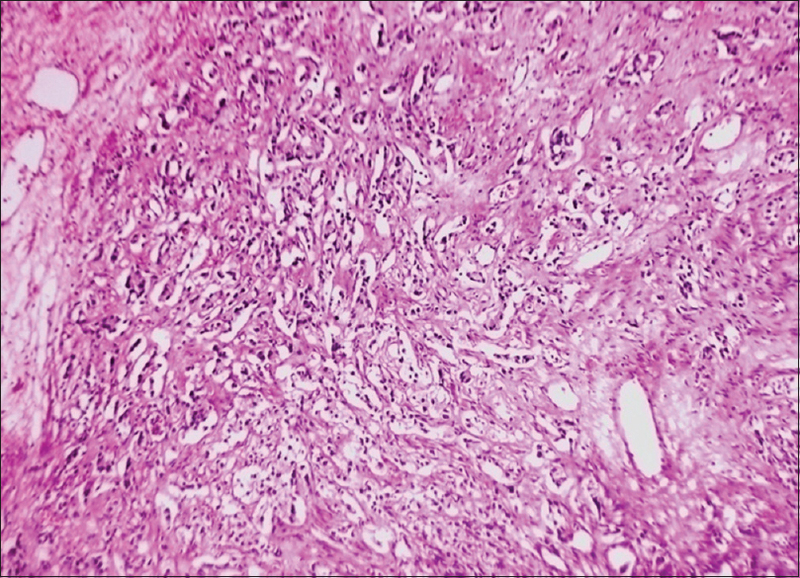 The sample received for histopathological diagnoses were either sextant biopsy (25 specimens), transurethral resection of prostate (68 specimens), and prostatectomy (15 specimens). Results: TPSA was performed in total 108 patients of prostatomegaly, of which 35 (40.22%) cases had TPSA in the range of ≤4 ng/ml, 37 (34.25%) cases had TPSA in the range of 4.01–10 ng/ml, and 36 (33.33%) cases had TPSA in the range of >10 ng/ml. The mean PSAD cutoff of <0.18 ng/ml/cc had revealed 79 (90.80%) cases of BPH. The mean PSAD cutoff of ≥0.18 ng/ml/cc had revealed 8 (9.1%) cases of BPH, 19 (100%) cases of PCa and 2 (100%) cases of prostatic intraepithelial neoplasia (PIN). Final tissue diagnoses in total 108 cases were as follows: BPH – 87 (80.55%) cases, PIN – 2 (1.85%) cases, and prostatic adenocarcinoma – 19 (17.59%) cases. Conclusion: The TPSA value over 10 ng/ml and mean PSAD value over 0.15 or over 0.18 ng/ml/cc can be used as criteria for prostatic biopsy. The mean PSAD cutoff of over 0.18 ng/ml/cc works superiorly for the diagnoses of malignant prostatomegaly, selection of the cases for the prostatic biopsy and medical or surgical management of prostatomegaly. Studying total PSA and PSAD as a marker at the differentiation of benign neoplastic and malignant neoplastic lesions of the prostate supported by statistical methods. To draw cutoff values of PSAD (0.15 vs. 0.18 ng/ml/cc) in suggesting benign versus malignant prostatomegaly at tissue diagnoses. The study was carried out in the Department of Pathology, Jawaharlal Nehru Medical College, Datta Meghe Institute of Medical Sciences (Deemed University), Wardha, Maharashtra over a period of 2 years from July 2014 to July 2016 in total 108 suspected clinical cases of prostatomegaly. The PSA levels were assessed by enzyme-linked fluorescent assay (ELFA) using Mini Vidas Biomerieux-ELFA strip reader using the kit of Vidas. The morning blood sample was collected from the patients before any manipulative procedure over the prostate, including DRE. PSAD was calculated as the ratio between total prostate-specific antigen (TPSA) and the volume of the prostate. The present study included 108 patients of prostatomegaly. The maximum numbers of patient recruited in the study were in the age range of 60–69 years and 70–79 years, having 49 (45.37%) and 43 (39.81%) cases, respectively. The age of the youngest patient of prostatomegaly in the present study was 45 years, and older one was 83 years. The age of occurrence of prostatomegaly and its tissue diagnoses is described in [Table 1]. The present study observed that the Grade II prostatomegaly and grades over it were clinically most symptomatic. The descending order of symptoms for benign prostatic lesions were poor stream – 70 (80.45%) cases, difficulty in voiding – 45 (51.72%), increased frequency – 42 (48.27%) cases, incomplete voiding – 39 (36.11%) cases, acute retention – 20 (22.98%) cases, urgency – 19 (21.83%) cases, nocturia – 16 (18.39%) cases, and dysuria – 15 (17.24%) cases. The descending order of symptoms for malignant prostatic lesions were difficulty in voiding – 18 (94.73%), increased frequency – 17 (89.47%) cases, incomplete voiding – 14 (73.68%) cases, poor stream – 12 (63.15%) cases, hematuria – 7 (36.84%) cases, nocturia – 7 (36.84%) cases, and acute retention, dysuria, and urgency – 3 (15.78%) cases each. Hematuria was observed with malignant prostatic lesions in 7 (36.84%) cases, but not seen in any benign prostatic lesions. In the present study, there were 16 (14.81%) patients of Grade I prostatomegaly, 56 (51.85%) patients of Grade II prostatomegaly, 35 (32.40%) patients of Grade III prostatomegaly and 1 (0.92%) patient of Grade IV prostatomegaly on DRE. The nodular, asymmetrical enlarged, firm, hard, and knobby to palpate the prostate with suspicion of malignant prostatomegaly was seen in 45 (41.66%) patients, out of which 19 (17.59%) cases turned out to be PCa and 26 (24.07%) cases were diagnosed as a BPH on tissue diagnosis. The average prostate volume and its final histopathological diagnosis observed in the study are stated in [Table 2]. In the present study, the association between the different prostate volume ranges with benign, malignant and premalignant lesion of prostate, derived value χ2 = 7.61 and P = 0.05, which is statistically not significant. Sextant biopsies under the guidance of TRUS were carried out in 25 (23.14%) numbers of cases. 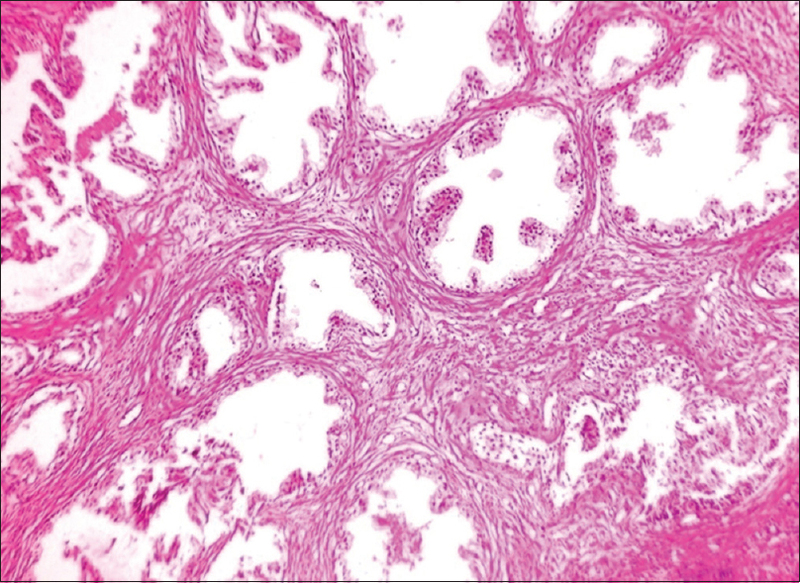 In 68 (62.96%) cases, the histopathological diagnosis was done from TURP specimen and in 15 (13.88%) cases the histopathological diagnosis was done by prostatectomy specimen. In the present study, there were 87 (80.55%) cases of benign prostatic hyperplasia [Figure 1], 2 (1.85%) cases of prostatic intraepithelial neoplasm [Figure 2] and 19 (17.59%) cases of adenocarcinoma prostate [Figure 3]. All the prostate cancer diagnosed in 19 (17.59%) cases was adenocarcinoma of the prostate, and its variant was not encountered on histopathological examination in the subsequent tissue of prostate in the present study. The total PSA in accordance with the normal established division in the ranges of ≤4, 4.01–10, and >10 ng/ml and the lesions within the prostate are depicted in [Table 3]. The lowest value of TPSA was 0.39 ng/ml and was associated with BPH and lowest TPSA value observed with PCa was 9.7 ng/ml. The statistical values for TPSA at 4 ng/ml as a cutoff for predicting benignancy or malignancy of the prostate had a sensitivity of 100%, specificity of 62.59%, positive predictive value (PPV) of 28.77%, and negative predictive value (NPV) of 100%. DRE was suspicious for malignancy in 45 (41.66%) out of total 108 cases, of which 26 (24.07%) cases had TPSA value of ≤4 ng/ml and 19 (17.59%) cases had TPSA value of >4 ng/ml. The DRE could diagnose the malignant cases correctly in 42.22%, i.e., 19 cases when compared with that of the raising value of TPSA and supported by tissue diagnosis. However, there were 26 (57.77%) cases which were erroneously suspicious of malignancy on DRE. The observation regarding cutoff for PSAD at 0.15 ng/ml/cc and are depicted in [Table 4]. The observation regarding cutoff for PSAD at 0.18 ng/ml/cc and are depicted in [Table 5]. The statistical values for PSAD at 0.15 ng/ml/cc as a cutoff for predicting benignancy or malignancy of the prostate had a sensitivity of 100%, specificity of 78.38%, PPV of 46.67% and NPV of 100%. The statistical values for PSAD at 0.18 ng/ml/cc as a cutoff for predicting benignancy or malignancy of the prostate had a sensitivity of 100%, specificity of 91.58%, PPV of 72.41%, and NPV of 100%. The present study had observed a single (5.26%) case of PCa and 36 (41.37%) of BPH in the intermediate TPSA range of 4.01–10 ng/ml. However, there exist no overlaps of PCa and BPH at PSAD cutoff of 0.15 as well as 0.18 ng/ml/cc in the intermediate TPSA range of 4.01–10 ng/ml. The present study observed the Gleason score of 5–7 in 18 (94.73%) and Gleason score of 2–4 in 1 (5.26%) case. It was observed that TPSA of a single (5.26%) case in the range of >10 ng/ml with a Gleason score of 2–4. The Gleason score in the range of 5–7 showed 17 (89.47%) cases of PCa with TPSA level >10 ng/ml and 1 case of PCa with TPSA level in the intermediate range of 4.01–10 ng/ml. The studies of Emokpae et al., Anushree and Venkatesh, Fang et al., Xess et al., Wadgaonkar et al., Ramos et al., Sasaki et al. and Zivkovic et al. had maximum patients in the age range of 60–69 and 70–79 years. The present study also had a similar observation for the number of patients with symptoms of prostatomegaly for the age range. The present study had 15 out of 19 PCa cases within the age range of 60–79 years. The similar observation for the age of occurrence of PCa cases had been observed in the study of Anushree and Venkatesh  (13/14) and Wadgaonkar et al. (10/11). The common symptoms associated as quoted by Emokpae et al., Anushree and Venkatesh  and Fang et al. for BPH were difficulty in voiding, poor stream, increased frequency, dribbling, and feeling of incomplete voiding of urine. The present study also made a similar observation for the symptom of benign prostatomegaly. The present study concurs with the observation of Emokpae et al. and Anushree and Venkatesh  that the malignant prostatomegaly is associated with hematuria. Cooner et al. had noticed that the malignant prostatomegaly on DRE had findings of induration, nodularity, asymmetrical irregular enlargement, and knobby prostate. They had diagnosed 565 out of total 1807 cases suspicious of malignancy. However, they had also observed that the DRE may misguide, as there were sufficient number of cases which were benign on tissue diagnoses. The present study is in agreement with the findings of Cooner et al. that there were overlaps, even benign prostatomegaly may mimic malignant prostatomegaly on DRE as the present study had 45 (41.66%) cases suspicious of PCa on DRE, of which 26 (57.77%) turned out to be benign on tissue diagnoses. The study of Udeh et al. and Stephan et al. observed no relationship between increases volume of prostate with that of increased occurrence of malignant prostatomegaly. The present study also had a similar observation. The present study has not observed clinical attentive complication while doing 25 (23.14%) sextant biopsy procedures. However, the study of Cooner et al. reported septicemia in two cases who did not take any prophylactic antibiotics and in three cases who had taken prophylactic antibiotics before the biopsy procedure in a total of 835 patients. One patient had developed intrapelvic hematoma and hematuria after the biopsy procedure. The PSA ≤4 ng/ml as a cutoff that would differentiate benign prostatic lesion and malignant one had been observed as a conclusive observation in the studies of Emokpae et al., Wadgaonkar et al., Sasaki et al. and Tauro et al. The findings of aforesaid study were congruent with the concluding observation that the TPSA value ≤4 ng/ml associated with benign prostatomegaly only. However, the TPSA value >4 ng/ml did not indicate the malignant lesions of prostate as had been observed in the study of Emokpae et al., Wadgaonkar et al., Sasaki et al. and Tauro et al. The study of Anushree and Venkatesh  had found 36 (26.4%) cases and 1 (7.14%) case of BPH and PCa, respectively, in the intermediate range of TPSA, i.e., 4.01–10 ng/ml. Udeh et al. in the study had observed that 57 out of 157 BPH cases and 15 out of 97 PCa cases in the intermediate TPSA range of 4.01–10 ng/ml. The present study had observed 36 (41.37%) out of 87 BPH cases and 1 (5.26%) out of 19 PCa cases in the intermediate TPSA range of 4.01–10 ng/ml. This observation is in agreement with the observation of Anushree and Venkatesh  and Udeh et al. The TPSA cutoff of 10 ng/ml suggesting the value below for its benignancy and value above for it for its malignancy had also undergone the scrutiny by a few studies. Stephan et al. in their study could find 117 out of 666 BPH cases having TPSA value >10 ng/ml. Anushree and Venkatesh  in their study could find 25 (18.3%) BPH cases having TPSA value >10 ng/ml while Wadgaonkar et al. had observed 6 out of 67 BPH cases in the TPSA range of >10 ng/ml. The present study had made the concurrent observation to that of Anushree and Venkatesh  Wadgaonkar et al. and Stephan et al. Wherein there were 16 (18.39%) cases of BPH, 2 (100%) cases of PIN, and 18 (94.73%) cases of PCa who had the TPSA value of >10 ng/ml in the present study. Therefore, the conclusive evidence for TPSA cutoff suggesting the benignancy and malignancy of the prostate for the TPSA value of ≤4 ng/ml and 4.01–10 ng/ml in the studies reviewed for present work were non endorsing in nature, but the TPSA value of >10 ng/ml may be utilized to aggregate prostatomegaly for its benign or malignant process to some extent. Abnormal DRE suspected of malignant prostatomegaly were observed in 26 cases of 87 histopathological diagnosis of BPH, and all these cases had TPSA values of ≤4 ng/ml. This parallax of abnormal DRE suspected of PCa with a normal TPSA cutoff of ≤4 ng/ml had also been cited in the study of Lavallée et al. and Agnihotri et al. which was similar to the finding of the present study. Abnormal DRE suspected of malignant prostatomegaly though appeared to be more sensitive in diagnosing the malignant cases, but it is confounding as many of the abnormal DRE turn out to be benign by TPSA estimation and tissue diagnosis thus suggesting discordance of abnormal DRE and the TPSA level. The studies of Tauro et al., Lujan et al. and Udeh et al. advocated mean PSAD cutoff of 0.15 ng/ml/cc that would enable to differentiate between benign prostatomegaly with that of malignant prostatomegaly. However, using the mean PSAD cutoff of 0.15 ng/ml/cc, Sasaki et al. missed 8 cases of cancer and could have saved 43% patient who had undergone a tissue biopsy. Lujan et al. had observed a mean PSAD cutoff of 0.15 ng/ml/cc and 11 cases of PCa got missed in their study. However, the study of Lujan et al. had not revealed the number of patients saved from the biopsy procedure using a mean PSAD cutoff of 0.15 ng/ml/cc. However, unlike the study of Sasaki et al. and Lujan et al., the present study did not miss a single case of PCa and PIN out of total 19 cases (PCa) and 2 cases (PIN) respectively using a mean PSAD cutoff of 0.15 ng/ml/cc. Therefore, it is a satisfactory test for detection of prostate cancer, but it is unsatisfactory at secluding the BPH cases for which further tissue assessment is required. Both the studies of Sasaki et al. and Lujan et al. had advocated to shift mean PSAD cutoff from 0.15 to 0.18 ng/ml/cc minimizing false-positive results requiring unnecessary prostate biopsy. The present study offers the similar observation in this regard. Mean PSAD cutoffs of 0.15 and 0.18 ng/ml/cc for their findings in their study reviewed in the literature were tabulated in the [Table 6] and [Table 7], respectively. The study of Sasaki et al. and Lujan et al. had concluded that the mean PSAD cutoff of 0.15 ng/ml/cc was unacceptable at differentiating BPH from that of PCa and therefore mean PSAD cutoff should be raised to 0.18 or 0.20 ng/ml/cc or above as suggested in their study. The present study is in agreement with the suggestion of the above studies but has not done the calculation beyond 0.18 ng/ml/cc, which is the mean PSAD cutoff for most of the studies and utilizes the purpose for the suggestion of biopsy. The studies of Wadgaonkar et al., Zivkovic  and Narayan et al. had observed that there was an overlap of TPSA values with the Gleason score. These studies had observed that the Gleason score and TPSA value were unrelated and the P value was statistically insignificant. The present study also had a similar observation. Per rectal DRE of the prostate is a conventional practice for the surgeons but its sensitivity is low. DRE alone is not the examination that would sufficiently select cases for the subsequent biopsies or medical and surgical management of prostatomegaly. The total PSA value over 10 ng/ml and mean PSAD value over 0.15 or over 0.18 ng/ml/cc can be used as criteria for prostatic biopsy. The PSAD appeared to be superior than total PSA at the screening of PCa and in avoidance of unnecessary biopsy. The mean PSAD cutoff of over 0.18 ng/ml/cc works superiorly for the diagnoses of malignant prostatomegaly, selection of the cases for the prostatic biopsy and medical or surgical management of prostatomegaly. Oesterling JE, Martin SK, Bergstralh EJ, Lowe FC. The use of prostate-specific antigen in staging patients with newly diagnosed prostate cancer. JAMA 1993;269:57-60. Emokpae MA, Das SC, Orok T, Mohammed AZ, Hassan SA. Early detection of prostate cancer: Evaluating the diagnostic performance of prostate specific antigen by comparing with histological technique among Africans. Indian J Clin Biochem 2004;19:62-6. Anushree CN, Venkatesh K. Morphological spectrum of prostatic lesions – A clinicopathological study. Med Innov 2012;1:49-54. Fang YQ, Zhou XF, Qiu JG, Wen XQ, Wang DJ, Pang J, et al. Serum PSA level and Gleason scores of needle biopsy specimens predict the postoperative pathologic grade of prostate cancer. Acta Med Mediterr 2013;29:279-83. Mazhar D, Waxman J. Prostate cancer. Postgrad Med J 2002;78:590-5. Caplan A, Kratz A. Prostate-specific antigen and the early diagnosis of prostate cancer. Am J Clin Pathol 2002;117 Suppl:S104-8. Xess A, Singh M, Raghwendra KH, Sharma HP, Shahi SK. 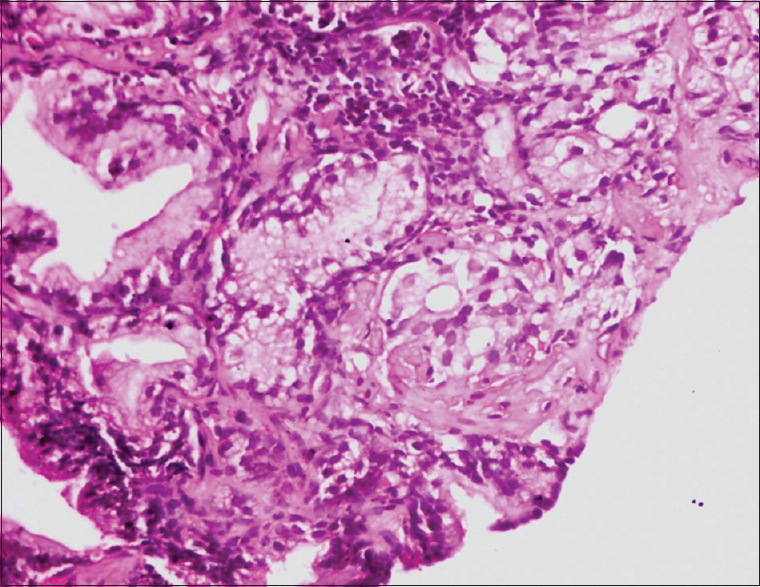 Prostate specific antigen as tumor marker: Relationship with histologic grading. Indian J Pathol Microbiol 2001;44:261-4. Wadgaonkar AR, Patil AA, Mahajan SV, Yengantiwar RP. Correlation of serum prostate specific antigen (PSA) level in various prostate pathology in elderly men. Int J Basic Appl Med Sci 2013;3:274-81. Schröder FH, van der Maas P, Beemsterboer P, Kruger AB, Hoedemaeker R, Rietbergen J, et al. Evaluation of the digital rectal examination as a screening test for prostate cancer. Rotterdam section of the European randomized study of screening for prostate cancer. J Natl Cancer Inst 1998;90:1817-23. Shahi SK, Ranga S, Khurana SK, Talib VH. Free/total prostate specific antigen Ratio: A new hope. Indian J Pathol Microbiol 1999;42:1-2. Jain S, Bhojwani AG, Mellon JK. Improving the utility of prostate specific antigen (PSA) in the diagnosis of prostate cancer: The use of PSA derivatives and novel markers. Postgrad Med J 2002;78:646-50. Ramos CG, Carvahal GF, Mager DE, Haberer B, Catalona WJ. The effect of high grade prostatic intraepithelial neoplasia on serum total and percentage of free prostate specific antigen levels. J Urol 1999;162:1587-90. Sasaki R, Habuchi T, Sato K, Akao T, Kakinuma H, Zhang LQ, et al. The clinical utility of measuring total PSA, PSA density, gamma-seminoprotein and gamma-seminoprotein/total PSA in prostate cancer prediction. Jpn J Clin Oncol 2000;30:337-42. Zivkovic S. Correlation between prostate-specific antigen and histopathological difference of prostate carcinoma. Arch Oncol 2004;12:148-51. Okolo CA, Akinosun OM, Shittu OB, Olapade-Olaopa EO, Okeke LI, Akang EE, et al. Correlation of serum PSA and Gleason score in Nigerian men with prostate cancer. Afr J Urol 2008;14:15-22. Obralic N, Kulovac B. High grade intraepithelial neoplasia of prostate is associated with values of prostate specific antigen related parameters intermediate between prostate cancer and normal levels. Bosn J Basic Med Sci 2011;11:223-7. Saleh AF, Nahar Rahman AJ, Salam MA, Islam F. Role of fine needle aspiration cytology (FNAC) in the diagnosis of prostatic lesions with histologic correlation. Bangladesh Med Res Counc Bull 2005;31:95-103. Manson MK. Cytology of prostate. J Clin Pathol 1964;17:581-90. Agnihotri S, Mittal RD, Kapoor R, Mandhani A. Raising cut-off value of prostate specific antigen (PSA) for biopsy in symptomatic men in India to reduce unnecessary biopsy. Indian J Med Res 2014;139:851-6. Stenman UH, Abrahamsson PA, Aus G, Lilja H, Bangma C, Hamdy FC, et al. Prognostic value of serum markers for prostate cancer. Scand J Urol Nephrol Suppl 2005;216:64-81. Epstein JI, Walsh PC, Carmichael M, Brendler CB. Pathologic and clinical findings to predict tumor extent of nonpalpable (stage T1c) prostate cancer. JAMA 1994;271:368-74. Ohori M, Wheeler TM, Dunn JK, Stamey TA, Scardino PT. The pathological features and prognosis of prostate cancer detectable with current diagnostic tests. J Urol 1994;152:1714-20. Işikay L, Yaman O, Bozlu M, Müftüǧlu YZ, Göǧüş O. Prostate-specific antigen density: The role in benign prostate hyperplasia, prostate intraepithelial neoplasm, organ-confined prostate carcinoma and advanced prostate carcinoma. Int Urol Nephrol 1995;27:757-61. Partin AW, Kattan MW, Subong EN, Walsh PC, Wojno KJ, Oesterling JE, et al. Combination of prostate-specific antigen, clinical stage, and Gleason score to predict pathological stage of localized prostate cancer. A multi-institutional update. JAMA 1997;277:1445-51. Catalona WJ, Southwick PC, Slawin KM, Partin AW, Brawer MK, Flanigan RC, et al. Comparison of percent free PSA, PSA density, and age-specific PSA cutoffs for prostate cancer detection and staging. Urology 2000;56:255-60. Cooner WH, Mosley BR, Rutherford CL Jr., Beard JH, Pond HS, Terry WJ, et al. Prostate cancer detection in a clinical urological practice by ultrasonography, digital rectal examination and prostate specific antigen 1990. J Urol 2002;167:966-73. Freedland SJ, Wieder JA, Jack GS, Dorey F, deKernion JB, Aronson WJ, et al. Improved risk stratification for biochemical recurrence after radical prostatectomy using a novel risk group system based on prostate specific antigen density and biopsy Gleason score. J Urol 2002;168:110-5. Tauro LF, Rao K, Shetty M, Rao BS, Shenoy DH. Significance of prostate specific antigen and prostate volume in the diagnosis of prostatic diseases. J Clin Diagn Res 2009;3:1274-84. Hoffman RM, Clanon DL, Littenberg B, Frank JJ, Peirce JC. Using the free-to-total prostate-specific antigen ratio to detect prostate cancer in men with nonspecific elevations of prostate-specific antigen levels. J Gen Intern Med 2000;15:739-48. Lavallée LT, Binette A, Witiuk K, Cnossen S, Mallick R, Fergusson DA, et al. Reducing the harm of prostate cancer screening: Repeated prostate-specific antigen testing. Mayo Clin Proc 2016;91:17-22. Lujan M, Paez A, Llanes L, Miravalles E, Berenguer A. Prostate specific antigen density. Is there a role for this parameter when screening for prostate cancer? Prostate Cancer Prostatic Dis 2001;4:146-9. Kundu SD, Roehl KA, Yu X, Antenor JA, Suarez BK, Catalona WJ, et al. Prostate specific antigen density correlates with features of prostate cancer aggressiveness. J Urol 2007;177:505-9. Udeh EI, Nnabugwu II, Ozoemena FO, Ugwumba FO, Aderibigbe AS, Ohayi SR, et al. Prostate-specific antigen density values among patients with symptomatic prostatic enlargement in Nigeria. World J Surg Oncol 2016;14:174. Narayan P, Fournier G, Gajendran V, Leidich R, Lo R, Wolf JS Jr., et al. Utility of preoperative serum prostate-specific antigen concentration and biopsy Gleason score in predicting risk of pelvic lymph node metastases in prostate cancer. Urology 1994;44:519-24. Alexander EE, Qian J, Wollan PC, Myers RP, Bostwick DG. Prostatic intraepithelial neoplasia does not appear to raise serum prostate-specific antigen concentration. Urology 1996;47:693-8. Stephan C, Stroebel G, Heinau M, Lenz A, Roemer A, Lein M, et al. The ratio of prostate-specific antigen (PSA) to prostate volume (PSA density) as a parameter to improve the detection of prostate carcinoma in PSA values in the range of &lt; 4 Ng/mL. Cancer 2005;104:993-1003.